A mezzanine floor, also called mezzanine platform, mezzanine, platform, first floor, loft or warehouse floor called, is a light and demountable construction that increases the networking area of a building. The floor finish consists of different types of wood or grids. Persons reach the floor by means of a step (35, 45 or 50 degrees). Goods and pallets can be placed on the floor with a forklift. To execute this safely, there are four different pallet handling systems. People on the floor are further protected by placing the open sides’ railings that meet all current European standards. 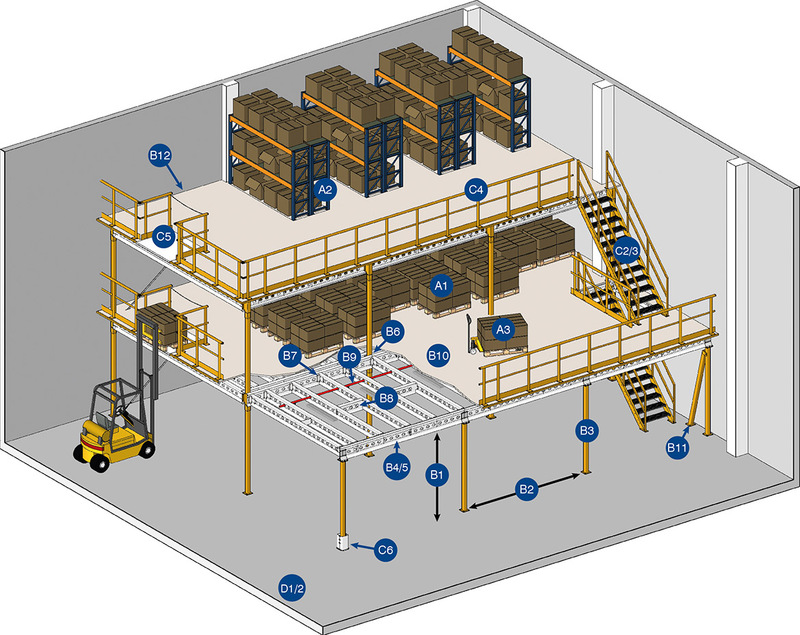 The image below shows a simplified layout of a mezzanine floor. With our flexible modular system we can supply mezzanine floors for every industry.